Until this year, I had never gone to the March for Life. My reasons for not going were both practical and principled. Practically, there is the problem for me of the 18-hour drive, never an attractive prospect. I also have had suspicions about the March based on principles. 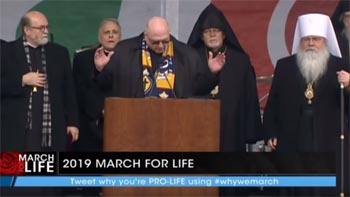 An event like the March for Life, after all, which attracts hundreds of thousands of people each year, would have to make concessions to both the civil authorities and those of the Conciliar Church, in order to be allowed to take place. Civil authorities, because it is necessary to secure the approval of the heavily pro-abortion government of Washington, D.C.; and the authorities of the Conciliar Church because Catholics, nominal Catholics, comprise 90% of the attendees, as I was told. In spite of my suspicions about the March, I felt I was not able to confirm them objectively until I had been present at the March in person, witnessing the goings-on with my own eyes instead of through the un-objective mainstream Catholic press, which does not criticize the March, or the secular press, which barely reports on the March in the first place. So, when I had the opportunity, I joined a group of conservative and traditionalist friends who were going to the March. Really, I was able to confirm my suspicions very quickly, almost as soon as the day's ceremonies began. I observed two major problems with the March for Life that I want to explain here. The first is probably more-to-be-expected in our revolutionary age: bad customs. The second is also not so difficult to imagine: ecumenism. I noticed bad customs in abundance during the March. 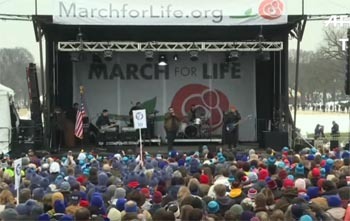 This year's March for Life was a raucous event with an atmosphere like a rock concert or a communist mob. It was absolutely contrary to the pious fable I had envisioned, a peaceful, orderly and principles-based gathering, even a kind of pilgrimage or crusade. Fortunately, there were some who adhered to these good ideas. There were a handful of traditionalist Catholic groups present at the March, including my own, and I have to applaud them for not joining the general spirit of anarchy. Unfortunately, most people do not appear to have these noble goals in mind when they go to the March. 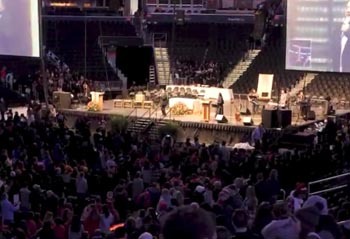 While some indeed go in a penitential spirit to try to make reparation for the national sin of abortion, most people present seemed to treat the event as a kind of mini-vacation. 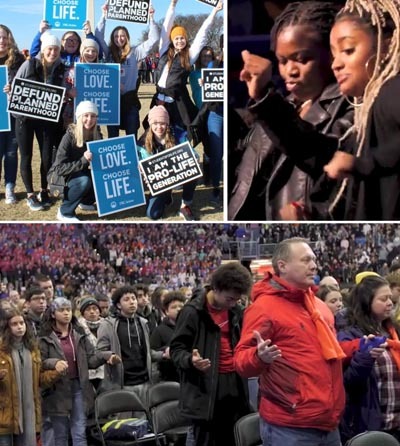 The filthy mindset of license that dominates epicenters of sin like Washington, D.C. seems to be also influencing the March for Life. When I say filthy, I really mean it, by the way. My first experience with the “vacation” mentality of other marchers happened when I had the grave misfortune of needing to use one of the inconvenient outdoor toilets. No other facilities were available within a reasonable distance due to the ongoing government shutdown that left most buildings in the area closed. I will mostly leave to the reader's imagination what I found in the facility. Suffice it to say, all of the outdoor toilets (and I tried several) were utterly disgusting. I realized simply on the basis of statistics that my fellow Catholics were most likely to blame for the mess since they were the overwhelming majority. After exiting that repulsive facility, my shoes were so dirtied that I actually attempted to clean by dragging them vigorously through the equally-filthy admixture of snow, mud and heaven knows what else. Not only the facilities but the grounds of the National Mall itself were the equivalent of a pigsty. Amidst all the filth, quite appropriately, was a very loud and disorienting live performance of rock and charismatic-style music, apparently performed by a “Christian” group, as part of the opening ceremonies. This bad music didn't end after the opening ceremonies: A very irritating contingent of persons from a church called St. John Cantius, dressed in “dazzling” fluorescent hoodies and banging drums, singing songs, and clapping their hands, tried to play the role of “cheerleaders” standing on the sidelines. Their group was so loud and obnoxious that it, and others, often drowned out the devout recitation of the Rosary and singing of pious songs by our small minority who didn't act like complete buffoons. I also cannot forget a group that pointedly insisted on loudly chanting the Divine Mercy chaplet while we prayed the Rosary. All of this tomfoolery, of course, was no doubt approved by the organizers. Attendance at the March may be 90% Catholic, as I said, but the March for Life is officially secular and does not take religious positions. Nor does it protest other issues of similar importance as abortion, such as the near-universal proliferation of contraception and the many millions of children born today in the state of illegitimacy. I think a traditionalist acquaintance put it well when he told me the March organizers are “out of touch” with the attendees. Also, for an event attended mostly by Catholics, it is downright tragic that false and schismatic religions received such dramatic attention. The schismatics who surrounded Archbishop Naumann on the stage for an opening prayer were introduced not once, but twice: first by the March's organizer Jeanne Mancini, and again at the apparent insistence of Archbishop Naumann, who began his speech by pointedly welcoming the same schismatics and their leader, Metropolitan Tikhon. Then, speaking not as representative of the Catholic Church but more as a kind of MC for the array of false religions on the stage, he led a vague and sentimental prayer on behalf of his "brother Orthodox and Catholic bishops," concluding his remarks with the cliché: "Change the world" (whatever that means). I do not deny that the March can be a source of grace based on the dispositions of those present. It is, after all, highly commendable to travel long distances in a truly penitential and dignified spirit to protest the inconceivably heinous outrage of abortion. But, I believe the general spirit of the March is not conducive to Catholic piety. 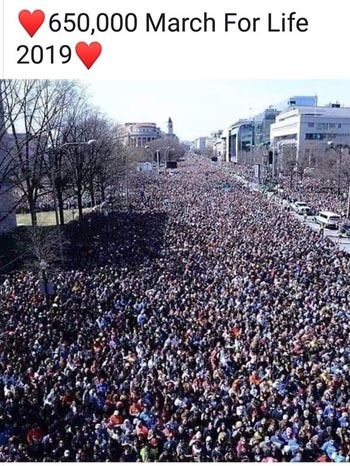 Also, I think the March cannot actually accomplish its laudable goal of abolishing abortion, because its organizers have untoward motivations to promote the Revolution in customs and ecumenism. The March for Life is an Ecumenical Woodstock. It is made in the same spirit as those infamous World Youth Days, and just like the World Youth Day, the March ends by being just another annual embarrassment to what remains of the prestige of the Catholic Church. Isn't this by the same person who said amusement parks and restaurants were un-Catholic? (04-11-2019, 08:17 PM)Paul Wrote: Isn't this by the same person who said amusement parks and restaurants were un-Catholic? And the same person who was banned here about six months ago? However, I forget the circumstances related to said banning. In short, he was being a jerk, calling people apostates and using this forum as a plug for his blog. It would be very sad if true, I know it's leaning toward this ecumenical stuff which is okay if it's done correctly, they should not have a 'joint' prayer with all the different faiths, like Trumps inauguration, they should have the different faiths have their own prayer separately. Also, for all we know there may have been several anarchists there trying to give it a bad name to hurt the cause, such as shaking up those toilets. (04-11-2019, 08:50 PM)josh987654321 Wrote: It would be very sad if true, I know it's leaning toward this ecumenical stuff which is okay if it's done correctly, they should not have a 'joint' prayer with all the different faiths, like Trumps inauguration, they should have the different faiths have their own prayer separately. Also, for all we know there may have been several anarchists there trying to give it a bad name to hurt the cause, such as shaking up those toilets.